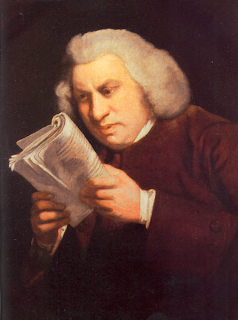 "Write No Lies of My Conversion"
As I mentioned in a previous posting, (“Look on My Works, Ye Mighty” May 9, 2009), I’m still reading my way through Samuel Johnson’s works, though in no particular order. I’m currently working on Volume 10, in which I came across an interesting piece of the good Doctor’s literary criticism (p. 85). Now, in a sense he’s right: to the modern reader, “owned” is the more natural reading. But here as elsewhere Johnson is too quick to assume that Shakespeare intended what is natural to we later readers, while blaming the less natural sounding reading on faulty or careless typesetters and editors. In truth, ow’d may have been a perfectly acceptable usage in Shakespeare’s time. According to the OED (entry: “owe”), the past participle of owe was owen (i.e. own) in Middle English and owen and oune were still used in this sense in the 16th and 17th centuries. Also in the OED (entry: “own”), from around 1200 in the Southern dialect, the past participle of own in our modern sense was owe, in keeping with that dialect’s habit of dropping final n’s. And of course, the Southern dialect was Chaucer’s, which would eventually become Standard English. Think of it this way: if X is owned, then X is owed to someone (i.e. its owner). Interestingly, owe and own are also related to ought. This one is more difficult to wrap one’s mind around. Think of ought as owe / own in the subjunctive mood, in which case “X is owed to / owned by A” becomes “It ought to be the case that X is A’s”. Enough of such pedantry. What is interesting about the fact that owe, own, and ought are etymological kindred is that Johnson, the great lexicographer, missed it. This is out of character, and can only be explained — at least in the case of his Shakespearean criticism — by his habit of underestimating the bard’s linguistic virtuosity. It is this assumption that leads Johnson to make so many obtrusive and unwarranted emendations in his Observations on Macbeth. He sees difficulties where there are none, and certainly not if one can accept that Shakespeare intended his art to be as challenging to his own audience as it is to us. Incidentally, this latter point was the position taken by British literary critic Sir Frank Kermode in his book Shakespeare’s Language. Where Johnson would try to rewrite a line to banish a perceived difficulty of sense or meaning, I am more inclined to engage Shakespeare on his own terms, which usually proves more rewarding. I shall close this essay with a little example of what I mean. “Yea, noise? Then ile be briefe. O happy Dagger. There are various readings of this passage. For example, modern editions usually render “’Tis in thy sheath” as “This is thy sheath”. But I would prefer to focus on the word “rust”. The first printed edition of the play, the first Quarto edition of 1597 has “rest” instead. Now, it would be typical of Johnson’s method of redaction to go with the first Quarto reading, because rest seems the more concrete or “natural” word, which Shakespeare is presumed to have intended. He would assume that rust, being less natural, was a later editor’s or compositor’s error. If so, Johnson would be wrong. The first Quarto has no authority as a source text; it was a pirated edition with so many errors that an authorized second Quarto by a different publisher was made necessary a couple of years later with many and substantive emendations. Every subsequent printed version in Shakespeare’s lifetime (and beyond) replaces rest with rust. (I should admit that I happen not to know which reading as a matter of fact Johnson preferred, as I do not have his edition of Shakespeare available to me. I have found his notes to that edition online, but the passage in question is unglossed). Aside from textual authority, I would submit that rust is more in keeping with the notion of decay. The notion of rest, though it is often associated with death (e.g. “rest in peace”), does not sit well with the anguished and violent nature of Juliet’s suicide. Rust accords more with the tragic nature of the situation, in which a beautiful fifteen-year-old maiden will moulder away in the very tomb in which she kills herself. Shakespeare, being a master poet of the uttermost magnitude, would doubtless have been sensitive to all of this. Johnson prefers concreteness (read: “naturalness”) in a poet. Unfortunately the great Doctor had the heavy soul of a moralist, and in this he excelled. He had not, however, the more airy soul of a poet, and his literary criticism too often suffers by this defect. It is what makes reading, for example, his Lives of the Poets tedious and maddening.